Gary Bosworth and Equine Empathy provide help for people experiencing problems with their horse. 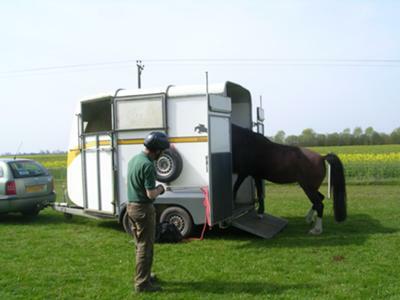 Gary can help with loading problems, leading, leg and foot handling, napping and other aspects of horsemanship. – Training sessions to help horses and owners experiencing difficulties with loading into trailers or lorries. – Help for horses that are reluctant to have their feet picked up, or are difficult with the farrier. – Training for bargy, difficult to lead horses. 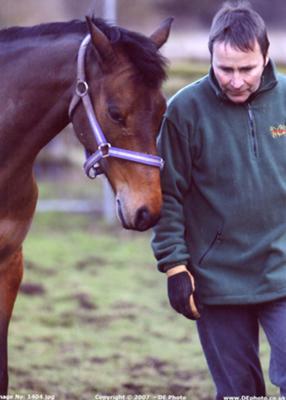 – General training sessions to work with you and your horse on groundwork and trust building. This helps overcome many problems that owners experience with their horses. Please note I do not teach riding. Anyone can learn how to work with horses the way I do and get results. Amazed at results in a very short time by: Kelly B.
Garry came to see my colts a couple of times. The boys were unhandled and although we’d managed to get them to the point of taking feed from our hands or eating out of a bucket we wanted to progress so sought professional help. Within a few hours we had head collars on 3 out of the 5 and made huge progress with the others (who needed more work as they had been traumatised at the dealer’s) and we even got a couple leading around and picking their feet up. It was amazing to see the results and how simple it was, but then aren’t most things in life simple if you know how? We have been able to use the techniques Garry showed us to continue working with the colts and even the 2 who were traumatised before are now friendly little souls who love a scratch, come to you to say hello, like being brushed and are really making huge progress. I’d recommend Garry to anyone with a horse, problematic or not! You can learn so much in such a short time and the bonds with your horse deepen. It’s amazing! Garry was a great help & in just one session my relationship with my horse was so improved that I was able to mount without it taking 2 people and he would stand still, he follows me around the field and lets me tack him up. I was very impressed by the gentle repetition and techniques, I recommend to anyone.